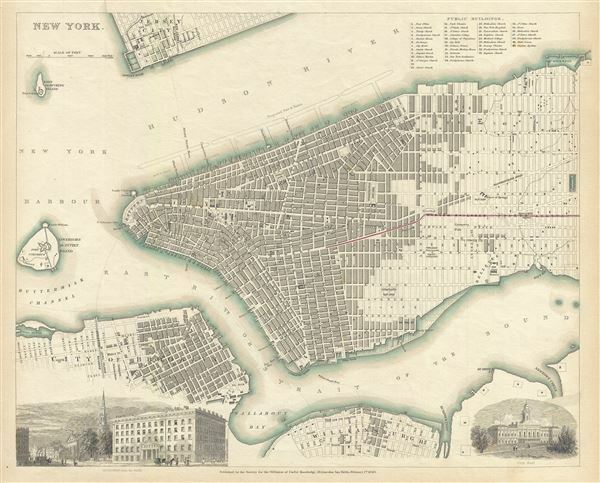 This is a fine 1840 first edition example of the Society for the Diffusion of Useful Knowledge's city plan or map of New York City. The map coves southern Manhattan from the Battery northwards to 42nd street as well as portions of adjacent Jersey City, Brooklyn, and Williamsburg. Governors Island and Ellis Island appear in the harbor. Massive proposed docks on the Hudson River, none of which actually materialized, as well as tentative landfills on the East Side and in Williamsburg are ghosted in. Shading illustrates the areas of heaviest development in each of the three cities depicted. In Manhattan specifically no less than 40 important buildings are identified numerically and by a key in the upper right quadrant. Several ferry lines are illustrated crossing both the Hudson and East Rivers. Red highlighting indicates railroad lines and tramways. In the lower quadrants engraved views illustrate 'Broadway from the Park,' that being City Hall Park with Trinity Church clearly visible in the background, and City Hall itself. This map was printed for the S.D.U.K. Atlas which was issued in several editions from about 1844 well into to the 1850s. Maps of the Society for the Diffusion of Useful Knowledge, Vol. 1, (London: Chapman and Hall) 1844. Very good. Minor toning and spotting. Haskell, D., Manhattan Maps A Co-operative List, 840. Map Collectors' Circle, North American city plans, 27. Branch, M.C., An atlas of rare city maps, p. 100-101 (later ed.). Rumsey 0890.192.